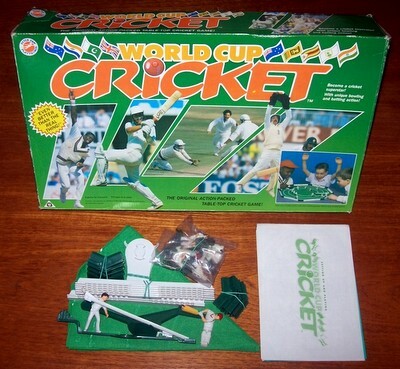 'WORLD CUP CRICKET' GAME: All the thrills and spills of Test Match cricket! World Cup Cricket plays just like the real game where each player takes his innings in turn and the unique bowling and batting action make every over a true test of skill. Place your fielders to contain the opposing batsman. This game is complete and in very good overall condition. The box is in very good condition; the playing cloth is also clean and the miniatures and other components are in excellent condition and sound working order.